NBA Great Isiah Thomas gives assistance to at-risk youths - Part I Sports icon allows his humanitarian spirit to guide his passion to empower America’s youth with greatest need. Isiah Lord Thomas III, popularly known as Isiah Thomas or “Zeke”, made a name for himself and honed his legend as a basketball player for the Detroit Pistons. However, before he launched his brilliant NBA career, Thomas burst onto the national scene winning the NCAA championship for Indiana University in 1981 while also earning the tournament’s Most Valuable Player award. A member of NBA’s Hall of Fame, after starring for 13 years with the ‘Bad Boy’ Detroit Pistons, Thomas led the team to back-to-back championships in 1989 and ’90. He was an All-Star player 12 times and captured two All-Star game Most Valuable Player awards and also added the NBA Finals Most Valuable Player in 1990 to his lofty resume. Named one of the 50 Greatest Players in NBA History and also served as part owner, executive and coach in the NBA, Thomas now serves as an analyst for NBA TV and works as a columnist for NBA.com. When I discovered I had the opportunity to interview Thomas, I have to admit I didn’t know what to expect. I was excited because I have always wanted to meet the guy named “Zeke” being that I grew up watching him play, but still I was hesitant. All I had to go off of was his career in the NBA and the chronicled “Bad Boy” image casted over him by White media as a member of the “Bad Boy” Pistons in the late 1980s early 90s. If not for the public projection of the established press, which detailed Thomas the basketball player, I didn’t know much about him. After meeting him I found him to be as humble a celebrity as there is in the world of sports, and that’s hard to come by. After researching Thomas’ life I was astounded to find out about his work as an activist over the years and his recent involvement with youth sports in America. Thomas recently received the Life Time Humanitarian Award from Children United Nations in Los Angeles during Oscar weekend. “The award is for just doing good work in the community with at-risk kids and foster kids,” said Thomas. Thomas spends a great deal of time using his foundation, Mary’s Court founded in in his mother's name to educate our youth and speak out on the violence occurring in inner cities across the nation. He specifically speaks to the need to educate our children. He firmly believes, education is a way out of poverty. He is working closely with clergy, educators, community and elected leaders in Chicago, Miami and other cities around the country to help address the urgent need to stop the violence. He is creatively using sports and entertainment as a way to redirect our kids into more positive activities. In fact, he is the founder of the first ever Basketball PEACE TOURAMENT that was held in Chicago. As a former youth growing up on the west side of Chicago, Thomas has partnered with the city’s mayor, Rahm Emanuel to expand his well-received "Windy City Hoops" basketball league, which would extend weekend tournaments to 10 more Chicago parks and recreation centers. “It’s a program basically to attract kids and youth in the community from ages 13 – 17 bring them into the park district and introduce them to the game of basketball and team sports,” said Thomas. “What we found is that in introducing kids or youth into sport and play they really get to know each other, they get to bond they get to connect. But so many times when we think about basketball we only think about the score of the game, but the things that come around basketball, the coaches you get to meet the mentors that you have, the educational resources that come along with that, the tutoring aspect that comes around that basketball game and just the wisdom that comes from people who come to the game watching you play. So that whole type of interaction when we talk about it takes a village to raise a child, well that type of communication that comes from being around the sport is what we were attracted to. 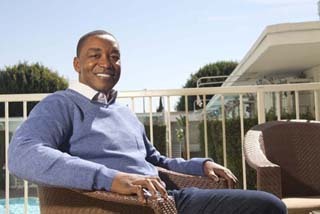 Read Part II of Isiah Thomas’ story, his relationship with his mother, how he met his wife of 32 years and how he views his legacy in next week’s L.A. Watts Times.